I was disappointed but within a few months the fears of my father came true. He died one day in mysterious circumstances. Many human rights activists demanded his autopsy but government authorities buried him within a few hours of his death. Fortunately or unfortunately, I never followed the advice of my father. I joined journalism immediately after his death on the wish of my late mother. She was a brave woman. She even encouraged one of my younger brothers to become a journalist and follow the footsteps of our father. She is no more alive to see that journalism is still a very dangerous profession in Pakistan. Three decades had been passed but situation getting worse for journalists in Pakistan. No doubt that there is lot of growth in journalism in the last one decade in the country. More and more young people are coming into this profession because they think media is independent and becoming a tool of social change in Pakistan. In fact media is paying a heavy price of its independence. Around 95 journalists had been killed since 9/11 in Pakistan. Many of them were kidnapped, tortured and killed. Sometimes we know their killers but they are more powerful than the law. I know dozens of journalists who have been forced to quit this profession or leave their home towns. I also know some journalists who refused to quit the profession and also refused to leave their home towns and as a result they were killed. Physical attacks and threats of violence represent an extreme form of unannounced censorship in Pakistan. Recently Tehreek-e-Taliban Pakistan (TTP) issued an edict against some media organizations. They especially decorated their edict with the pictures of their two most hated journalists. One is famous columnist Hasan Nisar and other is mine. This is not the first time TTP threatened me. They sent me a detailed threatening letter in 2012 when I took a stand against them after they attacked young education campaigner Malala Yousafzai in Swat. After few days of their threat a bomb was planted under my car and TTP accepted the responsibility of planting the bomb. TTP is not the only threat for me and other independent journalists. We are more worried about the double games and threats by our security agencies. Many times security agencies kidnapped and killed our colleagues but blamed TTP. Both TTP and our security agencies are enemies of media freedom. TTP pressurize media by accusing us of being anti-Islam. Security agencies try to dictate media in the name of patriotism but when we refuse to listen they declare us “anti-state” through their proxies in media. Take my example. I was first declared “anti-state” by the spokesperson of Pakistan Army on state controlled Pakistan Television (PTV) in 2005. My only crime was that I reached a mountain village of Neelam Valley of Kashmir where Army never supplied any relief goods after two months of earthquake. Intelligence agencies reported to military dictator Pervez Musharraf that I was maligning the Army on the behest of some enemies. Musharraf ordered the Vice Chief of the Army Staff to visit that village in a helicopter and verify the facts and ultimately I was proved right. After sometime a top aide of dictator Musharraf tried to use me against Chief Justice of Pakistan Iftikhar Muhammad Chaudhry and offered me Rs150 million for one television show against the CJP. When I regretted I was threatened and subsequently banned on television in 2007 along with five other TV anchors. After the departure of Musharraf I started highlighting the issue of missing persons in my television show but I realized that even though Musharraf was gone his policies were intact. I was contacted by ISI, the country’s powerful intelligence agency. They asked me to ignore the issue of missing persons in national interest but I tried to convince them that I was only performing my professional duty by highlighting violations of human rights guaranteed in the constitution of Pakistan. My explanation was considered as defiance and resulted in an attack on my children when they were going for their tuition in Islamabad. It was an attack below the belt which shattered my nerves. That was not the end. ISI tried to involve me in a murder case on the basis of a concocted telephonic conversation. Many fellow colleagues started my media trial on the pressure of a Navy officer posted in the media wing of ISI but nothing was proved against me in any court of law. In December 2011, I received some threatening text messages on my mobile phone. I decided to make public all the threats. A debate was started in our parliament on threats to media. Former speaker National Assembly Dr Fehmida Mirza formed a special committee to investigate the threats to the media. Ahsan Iqbal (now a minister in the PML-N government) was made the head of that committee. I provided phone numbers to the speaker from where I received threats. After few days an ISI official visited me and apologized on the “individual act” of some officers. He said, “it was the act of some individuals but the whole institution does not think like that”. I never pressed the issue because I have no personal agenda against any institution or person. The special committee of the National Assembly on the threats to the media submitted its detailed report to the speaker on March 13, 2013, but there was no mention of any investigation about threats given to me. Journalists in Pakistan don’t invite trouble only from TTP and security agencies. Sometimes diplomats of powerful countries also get angry with us. Former US ambassador Anne W Patterson wrote a letter against me and my fellow anchor Kamran Khan to my management three years ago when I discussed alleged activities of Blackwater in Islamabad. Recently, I was informed by the management of my TV channel that the head of one anti-democracy think-tank tried to hire a person to kill me. This fanatic is very much known for his links with intelligence agencies. Sometimes he declares me “CIA agent,” sometimes “RAW agent” and sometimes “a Taliban agent.” My TV channel filed a case against that person in a court of law and provided evidence that some anti-democracy elements funded by intelligence agencies are trying to blackmail independent media in the name of Islam and patriotism. A Karachi court issued arrest warrants of the accused but he is still at large because he is very thick with powerful intelligence agencies. Many people think that media is strong in Pakistan. They think I am influential but the fact is that I am not sleeping in the same place for about a year now. I am not living a normal family life just because I am a journalist. If I am living a miserable life in the capital of Pakistan then think about hundreds of other Pakistani journalists who are working in other conflict areas. They are more vulnerable than me. They are facing threat of impunity day and night from state and non-state actors. The government has failed to provide them any security. What should we do? Should we quit this profession? No! We will not because our readers and viewers are our biggest strength. The people of Pakistan are the best judge. They know we are fighting for their right to know. We are their hope. Enemies of media freedom cannot silence our voice because we live in the hearts and minds of our people. One thing is clear: we, the journalists, will keep fighting. We will not surrender. It is the constitutional obligation of government to provide security to journalist community. Government is aware of the threats to us from non-state actors as well as the state actors. If anything bad happens to us the government will be responsible. Three decades ago my father advised me to stay away from journalism. Now I am thinking to give the same advice to my son but I know he will not listen to me and the struggle will continue. 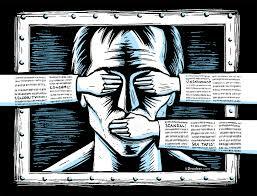 The new generation of Pakistan will not accept unannounced censorship in their homeland. The author works for Geo Television and writes for Jang Group. Indeed a dangerous profession, but can Pakistani journalists always do biased reporting, and making very big money compare to big companies, so they are receiving rewards for their so called journalism, same as police officers danger but attractive. please write something about malala father recent interview, if you think you always support the truth. Those who believe on said article are totally wrong. Once again Hamid Mir tried to get sympathies of intellectuals/writers. After some years, he often did such practice. He is a very crook journalist as well as good craftsman and very well knows how to twist the facts. He has written number of articles in favor of Taliban. He has written many articles for different institutions according to their needs. He did not tell us that how much he has earned and got benefits from his 30 years journalism? Hamid bhai you are really living in the heart of innocent people we really feel sympathy for u as u have put your life in danger for the cause of truth and for the sake of opressed humanity. you are playing a positive role. It hurts me too much when i see a post on facebook maligning your noble character. you have just the prayers of poor and helpless people as a champion of thier rights. we know that speaking truth is really a crime and it geopardise your life. but brave people like u rarely care for their life as they want to live and die for others. so put your trust in Allah Who is the best Protecter and supporter. Bravo & well done for this frank and candid piece Hamid Mir. May you remain safe, continue the struggle and give your grandson a contrary advice…! Co-incidentally, the person speaking in the telephonic conversation had same voice has Mr. Mir. So we now know that ISI so a so hi-tech agency that it can re-produce human voices in different conversations. what the heck… tell these lies to simple fellow Pakistanis who can believe this nonsense. He was a column writer for a very ordinary local news paper in 1999 and he benefited from the media freedom Musharraf govt gave by issuing licenses to pvt TV channels which got him now a celebrity and but he loves to malign Musharraf and wishes he being hanged. What a moron! Weldone Hamid Mir and weldone Freedom Network to raise voice against impunity.Some people are spreading hatred against Hamid Mir on social media because he refused to take dictation from powerful establishment of Pakistan.He filed a petition against secret funds in supreme court and exposed many black sheep of media.Secret agencies are not happy with Hamid Mir because he closed the door of their secret funds in information ministry through a petition.I remember Hamid Mir started exposing enemies of media after the killing of his journalist friend Hayatullah Khan in 2006.He again stood by the family of Musa Khankhel.He raised voice against the murder of Salim Shehzad,Wali Khan Babar,Abdul Haq Baloch and dozens of other journalists.Hamid Mir is pride of Pakistani media.Some sponsored elements in media cannot demage his credebility.I am nothing but as a peace loving and law abiding citizen i am with Hamid Mir because he is our hope. I think Hamid Mir should write a book for young journalists on how to work in conflict areas.Whole Pakistan is becoming a conflict area and its difficult to work for journalists in cities like Karachi and Peshawar.These days I am under pressure from my family to stop working in a newspaper but people like Hamid Mir are a ray of hope for us.Many people are jealous of Hamid Mir and they make allegations on him but nothing ever proved against him in any court.I am waiting for his book on conflict reporting.